Exclusively dedicated to professionals, Jex Professionnel has quickly become the essential brand of professional hygiene. Manufacturer and quality brand, Jex Professional is recognized for its technicality, performance, efficiency and professionalism. Its range of products, declined by universe and combining both multi-purpose products and products for specific uses, is very complete and perfectly adapted to the needs of the professional market. The triple Action 3D / 2D Professional Jex allow a complete cleaning and a healthy and fragrant long-lasting atmosphere. Perfect balance between professionalism and pleasure, the range Triple Action offers the choice between different perfumes (8 in all) and different actions (degreasing or disinfecting). In addition, the references with the unique technology "Stop Odors" act even more effectively by destroying bad odors (cooking, ammonia, frying, animals ...) while perfuming durably. 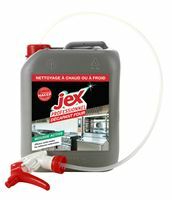 Jex Professional is a complete range of maintenance products developed for professionals with efficient formulas that respect the environment. Jex products is the safety of a recognized manufacturer through a brand that is itself a reference in the field of professional hygiene. The new regulatory framework for the use of products now requires companies to provide cleaning agents products with the minimum impact in terms of harmfulness. In fact, in the opposite case, all the necessary PPE must be made available to the agents.